Google Chrome Updated. You too update! Google Chrome - One of my favorite web browser which is on it's way in increasing it's user base. Today morning my version of Chrome updated to 5.0.342.8 which is a beta update. Restarted my browser and started finding the new things implemented. Here is a quick look at the enhancements I found in this version. 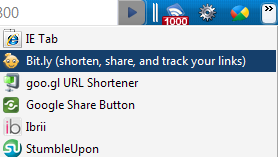 The first thing I noticed in this update is, Favicon is toggling whenever I hover my mouse over it. See the below images. First pin the tab to see this effect. When Chrome announced Extensions people started downloading and using many useful extensions for their needs. But many reported a problem saying "Extensions are killing the Address bar length". Now, Chrome got a movable separator by holding which you can collapse / expand your extension gallery. The collapsed items are displayed in a menu which is available with click on ">>" button. Along with this there is another separator which separates the Extensions and the Tools, Settings menus. This is yet another powerful option helps in getting back the closed tabs instantly. While working on multiple tabs accidentally we close the tabs which are supposed to be open. The tab menu item "Reopen closed tab" helps in recovering it immediately. But if multiple tabs are closed and getting all of them back is a bit tedious job by clicking "Reopen closed tab" for each tab lost. The new enhancement for this is, when ever a tab (pinned) is accidentally closed it temporarily kills that tab and removes the entry from the Task Manager. But still that tab is available in the Tab Bar in a disabled mode. Clicking on that tab again reloads the page. Have a look at the following images. In the first image both Facebook and Twitter tabs are active. In the second image the tab which is showing Twitter favicon is dead. Hope you liked the new options and let's expect more powerful features in the near future. If you liked these features or found any new in this update then leave a comment in the below comment section. A long wait and after many unofficial reports, Google has finally unveiled it's latest product Nexus One - a Google Phone. The operating system supported in this is Android which was developed as an Open Source project by Google. The hardware manufacturer of Nexus One is HTC. This is how Nexus One looks. As per the Technical Specifications, Talk Time on Nexus One is up to 10 hours on 2G and 7 hours on 3G. For more specifications surf to Nexus One Technical Specifications. Currently, without a service plan it is costing around $529 USD and is available at few places only. Let's see when this will hit INDIA. What is your impression on this Nexus One? Leave a comment.